Several other players made a significant impact, including Eloy Jimenez of the Cubs, who drove in the World team’s first run in the sixth, made a spectacular catch in right field in the seventh, and then capped off a seven-run ninth inning with a three-run shot that traveled 401 feet (pictured above), hitting the facing of the third deck of the Western Metal Supply Co. beyond left field. Ok, Eloy Jimenez … we see you! For the USA team, Alex Bregman of the Astros stood out with a triple, double, and single, coming up a home run short of a cycle. However, Bregman’s error in the eight inning allowed what would prove to be the tying run to reach base. Manuel Margot of the Padres was another standout, scoring two runs, driving in another, and robbing Cardinals prospect Carson Kelly of a home run in the sixth inning. 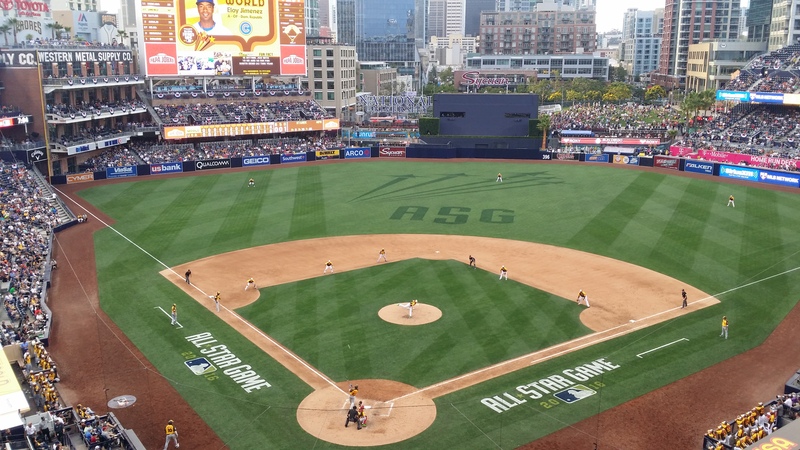 The 2016 All-Star Week festivities continue today with Workout Day (including the Home Run Derby) and conclude tomorrow with the 87th All-Star Game. For continuing coverage and photos, follow ASG News on Facebook, Instagram, and Twitter.